A new ‘timeless’ classic! The Age of Adaline, from Lions Gate, is a beautiful modern-day fairy tale that will prick your curiosity and capture your imagination. 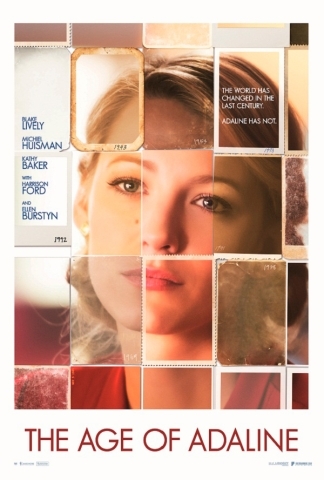 Blake Lively shines as Adaline, an ageless woman in an ever-changing world. Borrowing elements from the popular children’s novel Tuck Everlasting and the Academy Award winning film The Curious Case of Benjamin Button, this movie takes what the preceding stories did and develop a new movie around the concept of a character with prolonged life. Fortunately, director Lee Toland Krieger sets his movie apart from others, in a similar sub-genre, so the audience can enjoy a fresh take on a plot that is reminiscent a Twilight Zone episode. I won’t go as far as to say this was a completely original concept; but, it is clear that this movie throws what’s been done into a blender, added some additional ingredients, to produce a story that combines the best of a fairytale with a romantic drama. From ‘time to time,’ there are movies that show love as something that can be beautiful and painful, and this is definitely one for your movie library. The Age of Adaline is about Adaline Bowman (Lively) who lead a very nondescript life in the early 20th century until one day, following a tragic car accident, she is blessed and, at the same time, cursed with eternal youth. Realizing that she will never age past 29, Adaline must keep running and changing her identity every decade so as no one discovers her secret. Although it means leaving the daughter she loves so dearly and never allowing herself to experience true love, Adaline is unable to let anyone into her life for fear of becoming a specimen in a science experiment. Depressing as it is, everything is going to plan until one day, Adaline has a chance meeting with a charismatic philanthropist named Ellis Jones (Michiel Huisman). As hard as Adaline plays hard-to-get, she is ensnared by his generosity and persistence. After reluctantly agreeing to travel with him to his parents’ place for their 40th anniversary, Adaline comes face-to-face with her past when she meets Ellis’ dad William (Harrison Ford). Follow Adaline through the 20th and 21st centuries as she attempts to maintain a relationship with her daughter, hides from love, and then falls in love, all while coping with her seemingly immortal youth. At the center of the movie is 29 year-old Adaline. Blake Lively was an outstanding casting choice to play the century-old protagonist. Lively’s passion for design and style is clearly visible through her character. This is impart thanks to the costuming and makeup departments on the film. Bringing the costuming and hair/makeup to life for the screen, Lively embodies the idea of a sense class that transcends the decades. Despite how easy it would have been for the character of Adaline to be one-dimensional and mostly stagnate, Lively plays the role in such a way that she adds depth and shows development through the story. In indirect and subtle ways, Lively displays the pain and loneliness Adaline must live with everyday. As her counterpart, Michiel Huisman plays the gentleman who captures what’s left of her heart. Even though we don’t get a lot of backstory or exposition regarding the character of Ellis, it is apparent that he has been longing to find someone to love for most, if not all, of his adult life. Not nearly as well-developed as Adaline, Huisman takes the role of Ellis, who essentially represents the opposition to Adeline’s goal of no one discovering her secret for fear of what may happen, and portrays a character that the audience can fall in love with and feel his pain of not having his emotions reciprocated by Adaline. One of inescapable elements of the movie, the audience first enounters, is the omniscient narrator. This sets the mood for and indirectly explains to the audience that this is a fairy tale. Unlike many fairy tales, this is one that is grounded in a pseudo-science, so it helps to bolster the believability of the plot, within the confines of the narrative that is. Although having the narrator helps to create the atmosphere of a modern-day fairy tale, there are definitely times in which the exposition was a little too much. After all, the very foundation of a movie is anchored in the concept of showing and not telling. It isn’t that a movie cannot include voiceover, but it needs to be kept from explaining elements that could be shown visually instead. When a narrator is describing something with words at the same time it’s being shown on screen, the exposition becomes a trifle redundant. However, there is plenty that is shown, and quite well, in the movie. Speaking of ‘shown,’ another technical element of the film that is sure not to go un-noticed is the gorgeous cinematography (by David Lanzenberg) and production design. Not that it is flashy or profoundly groundbreaking, but that it displays a sense of timeless class that supports the narrative and moves it along instead of becoming the spectacle in and of themselves. Regarding any areas of improvement, the aspect of the plot I found lacking was the under-developed external goal; we deal mostly with internal opposition and growth. A well-written story needs a protagonist with a well-developed external goal and well-defined opposition to that goal. The closest we get to an antagonist and opposition is through the characters of Ellis and William (Ford). More like anti-heroes than true opposition, they pose a threat to the life Adaline has lived for over 80 years. A plot element that often, when used, gets abused and written haphazardly is the flashback. Writers must be very careful when integrating the concept of storytelling with the tool of the flashback because sometimes the audience is left to wonder whether the main story is the present one or the one being told through flashbacks. Fortunately, writers J. Mills Goodloe & Salvador Paskowitz, handle this fragile plot tool carefully and keep the focus on the present story while using the flashbacks as support. Taking place around New Years Eve, this movie may have been better-received by many critics had it been released during the Holidays. Never-the-less, I feel strongly that is is a beautiful movie that is definitely worth a watch this weekend. It may not be the next Academy Award winning love story, but it is still an all-around well-produced and directed film that most anyone will enjoy alone or with their significant other. It’s also refreshing to see another romantic movie released by the studio best-known for their horror films. If you liked this review, check out my others; and better yet, SUBSCRIBE and SHARE.